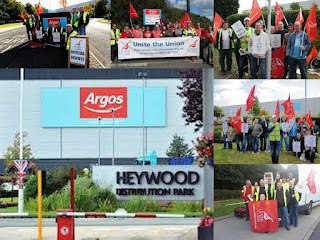 Workers at retail giant Argos have started 4 days of strike action to save their pension scheme from closure. Heywood in Lancashire and Castleford". purchase (defined contribution) scheme worth 50% less. I haven't got all the full details but it seems so far that Argus are claiming they have to close because the scheme is in "deficit". This excuse is usually rubbish. If your employer claims that it has to close its pension scheme then firstly consider the following "Rules" (Excuse me for SHOUTING but it is important). Rule Number One: Closing your pension scheme DOES NOT GET RID OF THE DEFICIT it could MAKE IT WORSE! If you have a deficit then it still remains on the Company books even if you close it to future contributions. If you close the scheme you have no new money coming in and have to sell your best investments to pay existing pensioners. This is crazy. All you do is hand out a blank cheque to your advisers to run a smaller and smaller, ever more expensive liability with little or no chance of any upturn. Rule Number Two: Your so-called pension deficit figure IS NOT REAL, it is measured in "FUNNY MONEY". Pension deficits are worked out according to something called "mark to market" accounting. Which is completely lala. The deficit for many schemes can vary day to day, week to week, month to month, by millions and millions (and even more for bigger schemes) of pounds, regardless of the real strengths of the fund. Not only that but many schemes are valued according to the interest rate of UK government loans called "gilts" (don't ask). Due to the current completely bonkers Alice in Wonderland economy, these gilts return are currently at a 200 year low, yet they are still used to decide whether your pension scheme is in good shape or not! MADNESS. The Government Pension Minster, the Bank of England, the CBI all recognise that this is nonsense and things will have to change, but so far they have done nothing. But why close your scheme forever, when you know that its rules will change soon, for the better!!! Rule Number Three: Unless your employer contributes enough money into a decent pension scheme you and your spouse will retire and DIE IN MISERABLE POVERTY. There are Rules Number Four/Five/Six or even Seven: but they don't really matter. Rule Number Three trumps them all. There is more stuff workers and trustees can use. The AMNT will be publishing a detailed guide to help trustees defend their scheme soon. We will also give personal help and support to any AMNT member trustees facing this problem. Good luck to the Argos strikers fighting to defend their futures.